• On Waiting for Superman: "fundamentally dishonest" with a fuller review here and in the New York Review of Books. • There are no easy answers… [in public education] have to educate students one at a time and take in all that come. • On Bill Gates: "destructive influence"
Once the archive is posted, listen to the hour discussion and see the context in which those comments were made. 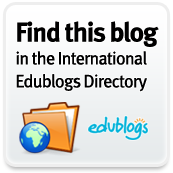 Plus works by Carol Dweck and by Jennifer Fox; a recent post in Psychology Today the Educator’s PLN. Looking forward to our book group discussion of Death and Life of the Great American School System next week. Heard Steve Hargadon's interview tonight and he reminded the attendees about the upcoming Global Education Conference (November 15-19). There will be over 350 sessions. Here is a schedule using Chicago times. I saw Vinnie Vrotny's name (8pm on Nov. 15) and expect there are several others we will recognize. Quick reminder about an upcoming LOCAL presentation from NSSED (North Suburban Special Education District): "Use of the iPod, iPad, and iPhone to Support Students with Special Needs at Home and in the Community" Tuesday, November 16th 9:30am to 11:30am at our Northfield campus. Presenter is Patrick Black whose blog is here. Click the following links for more ideas on iPad apps for Special Education from David Lignon and Eric Sailers. NPR Bob Edwards discussion: impact of school libraries and librarians on student achievement. Traveling in the car, my ears perked up when I heard Bob Edwards discussing school libraries. Edwards spoke with Keith Curry Lance who bemoaned the current budget cuts on school libraries. Although many studies show that students with access to a full-time, fully-staffed school library perform much better academically, school librarians across the country are being cut. The Colorado studies done by sociologist Keith Curry Lance demonstrate the impact school libraries and librarians have on student achievement. Yet, the American Library Association reports library budget cuts in more than 20 states. Part of the reason is that most people do not know what 21st Century librarians actually do. It is up to administrators and librarians to showcase how librarians collaborate with teachers for the public to understand our role in schools. This month, we celebrated the 40th anniversary of Alvin Toffler's Future Shock. Here's a link to predictions from his organization: 40 for the Next 40. This is the one view of the future for which we are educating today's students. Note particularly the reference to rapid access to experts (page 5) and the importance of networks linking "answer seekers" with "problem solvers". The report says knowledge will be an increasing source of capital (page 10) and specifically that "US will make international education a top priority, encouraging Americans to travel to other countries and see themselves as part of the global community"
How can we ever 'reform' education with principals like this? Qwiki is launching soon. Want to be the first to have the information experience? Join their invite-only alpha, to help make Qwiki great. "The service scours many information sites on the Web, mostly Wikipedia, but also LinkedIn, Google Maps, Fotopedia, and CrunchBase, and creates a Qwiki that you can watch about that topic. A Qwiki looks like a narrated video, with matching images popping up as a female speech-to-text voice tells you about the topic you’ve chosen. All of this is done algorithmically. It is not reading any one given entry in Wikipedia or anywhere else, but rather summarizing that information first and then presenting it in a brief and very visual way. After each Qwiki is completed, you are presented with a selection of related Qwikis so that you can keep on exploring. Of course, there is also the search box. Currently, there are Qwikis for about 3 million topics and growing. This is still a private alpha though, and if you do sign up, you will be asked to provide feedback after each Qwiki so they can improve them before opening up the service to the public in a few months." Pretty amazing. The voice is somewhat annoying and I would probably rather use Mashpedia, but I am still wowed by the technology. I signed up for the private alpha and they sent an email stating that I should look forward to login information soon. Macs: Microsoft Office 2011, "The iPad Goes to Work," and "IPod Bonanza"
These three articles are also in the current issue of MacWorld (November 2010). With a focus on compatibility and collaboration with Windows, expanding uses for the iPad, and new models of the iPod, there is a plethora of useful and fun information and ideas. You can also take a look at the web site for plenty more ideas, stories, and articles. Take a look at the current issue of MacWorld - November 2010 - and it's cover story "Appstravaganza!" The 2-page spread of the introduction is a sight to see, along with the 177 apps for iPhone, iPod touch, and iPad. The article is well-organized with a format that is easy to skim for an overview, browse according to your interests, and view the look of the app. A few are highlighted in the podcast with Philip Michaels and Lex Friedman. From music to data storage to food to sports, so much is here! The YALSA blog features Evernote as their app of the week! "Evernote’s ability to keep you organized is great. For teens, it’s a chance to keep information in a safe place that can be accessed from anywhere, which can eliminate compatibility problems. And if a teen can start taking sophisticated notes – web research, photos of pages in printed materials, and their own annotations – on a smart phone, that’s fabulous. Imagine how powerful this tool could be in the hands of students. Which is another reason to let cell phones into the schools…"
See the New Trier Library guide to Evernote and start learning how to get organized. Read about eight noteworthy reads on Information Literacy, Libraries, and New Literacies from The Unquiet Librarian. As part of this blog post, Buffy Hamilton also shared this video by Alison Head and Mike Eisenberg from the Information School at The University of Washington which analyzes how class assignment handouts promote research strategies. iClippy works by capturing the visuals from screen, camera, or scanner to an online clipboard without having to save the pictures to the local computer first. The images are immediately available for pasting into email, online document, blog, instant message, twitter, facebook, or any other number of resources. The images are also searchable both from the web and from the local sidebar. The images are automatically scaled down to the size that’s appropriate for online resources and as defined by the account type. Can I access the images in my clipboard from the desktop? Yes, iClippy comes with a native sidebar application which allows you instant access to your iClippy library. The sidebar allows listing through pages of images, narrowing down the set through search, pinning the image to not be replaced, copying the image into the local clipboard for further use with local or online resource, deleting an image, following the link which is attached to the image, and more..
How do I share an image with a friend or colleague? You can share the image one of two ways: 1) by simply copying and pasting – just select the image you want from the sidebar, select it, and paste it into email or IM message; 2) by sharing the clipboard gallery link. To find a link to an image, proceed to http://my.iclippy.com, find the image you’d like to share, and send its URL. This method will allow the other person to comment on it. How long are the images kept in iClippy? The images are kept indefinitely, however are subject to the maximum number of images in the account. Once you go over the limit, the old images are replaced with the new ones in first-in-first-out fascion, for as long as they are not pinned. You want to pin the images you don’t want deleted. What is the difference between iClippy and Evernote? Evernote and iClippy each have their strengths: Evernote is best at keeping text notes, and iClippy is all about acquiring, storing, and using images. By focusing on images, iClippy can enable things like feeding your picture frame, making it easy to paste picture content into web application, or presenting images in widgets. iClippy also takes a different approach to the user interface: instead of being a floating window application like Evernote, iClippy is docked as a sidebar, allowing fast access to the clipboard. Finally, iClippy doesn’t store contents locally, meaning that both its memory footprint and how it uses system resources are more efficient. 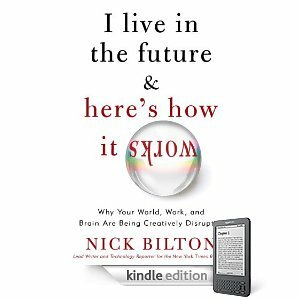 A couple of days ago I posted a short piece on Nick Bolton's new book: I Live in the Future and Here's How it Works. He examines the spirit of our digital age, providing commentary on how a radically changed media world is influencing human behavior. Now, even before reading it, I can see others' notes on the book! shared from their highlights and Kindle notes. See Jenny Levine's [Shifted Librarian] notes for this book shared at Amazon. I have spent early morning hours looking at some video applications shared by Jenny Levine [Shifted] on Twitter. She really loved this amazing application which plays 20 YouTube music videos simultaneously. Didn't care for the music, but the application is great! My hyperactive brain was led to another site that is so web 2.0! and ridiculously easy! Love this one! YouCube is a project put together by Aaron Meyers. It allows the user to map YouTube videos onto an interactive 3D cube and then save it to a database so you can share with others. As you spin around a YouCube, the sounds of the different videos fade in and out. To see an example of the functionality click here to watch "In the News". The key to a good listening/watching experience is to allow sufficient time for all the videos to properly load. Then it's really fun. Students will have a blast with this because it feeds their fractured, hyperactive attention span. Many adults would find it too distracting. I have spent enough time on the Internet that it feels right! Easy to use: Just copy & paste URLs from 6 different but related videos on YouTube. Then you can share your creation out to the world with a distinct URL. Visit the YouCube page and make your own...Here's one I made for Evernote. Education Week just published an interview with Will Richardson. They also note that you can "join Will Richardson as he discusses how teachers can effectively integrate Web 2.0 tools in the classroom and leverage the power of personal online-learning networks". That session will be available online Wednesday, October 27th (3pm Central Time); sign up here for a reminder. or the reinvention of print continued... Amazon announced today that it will launch "Kindle Singles"--Kindle books that are twice the length of a New Yorker feature or as much as a few chapters of a typical book. Arguing that writing and expression of ideas should find its natural length and not be constrained by economic concerns from publishers of full length texts or magazines, Amazon is asking writers of 10,000 to 30,000 words (roughly 30 to 90 pages) to join in making their work available to readers. According to the press release, like all Kindle content, Kindle Singles will be "Buy Once, Read Everywhere"--customers will be able to read them on Kindle, Kindle 3G, Kindle DX, iPad, iPod touch, iPhone, Mac, PC, BlackBerry, and Android-based devices. In the North Pacific ocean, there were two approaches to boat building. The Aleuts (and their kayak-building relatives) lived on barren, treeless islands and built their vessels by piecing together skeletal frameworks from fragments of beach-combed wood. The Tlingit (and their dugout canoe-building relatives) built their vessels by selecting entire trees out of the rain forest and removing wood until there was nothing left but a canoe. The Aleut and the Tlingit achieved similar results — maximum boat / minimum material — by opposite means. The flood of information unleashed by the Internet has produced a similar cultural split. We used to be kayak builders, collecting all available fragments of information to assemble the framework that kept us afloat. Now, we have to learn to become dugout-canoe builders, discarding unnecessary information to reveal the shape of knowledge hidden within. *** To read more responses from Nichols Carr, Howard Gardner, Howard Rheingold and others go to the Edge site and scroll down about one-third of the way until you see a grey box on the left with 172 contributors (sorry, the anchor link to there is not working properly). If you want to read more and have a New Trier login, go to CQ Researcher's recent (Sept. 24, 2010) report on "Impact of the Internet on Thinking"
And if you are looking for a book length discussion, read The Shallows and/or Cognitive Surplus. Shared by Mary Ann Apple: Trailmeme is a new web publishing tool that you can use to create a trail of content on a specific topic you are investigating. Trailmeme allows you to gather related content from the Web, map it, and order or sequence in multiple ways to make sense of it. Any number of pages can be collected, organized, and annotated in a way that gives meaning to the topic. There are a variety of ways to "create your trails": you may select an existing trail or start a new trail. You may edit privately until you wish to make your trail public. As you gather informational websites into your trail, you may add "Blurbs," "Editorial Comments" and "Tags" to enhance the trail experience. Viewers can also read other peoples’ trails and "walk them" to keep up with any updates that are made. See the example titled "The 2010 Midterm Elections" or the 2010 Gulf Oil Spill. Take your audience on a journey as you curate the web! I imagine that librarians could use trail meme to create a really cool pathfinder for students. how businesses try to engage with customers in new ways that go beyond merely selling information; they are experimenting with creating unique and meaningful experiences. further developing his point of view and delving into the research that shaped the central ideas of the book. He not only expands the content but also allows readers to join the conversation by commenting on each chapter. Click here to view auxiliary content to: I Live in the Future and Here's How it Works [Nick Bolton]. In just a few short years our reading experiences will be fundamentally altered. This week The New York Times bemoaned languishing picture books while PBS alerted me to site where anyone can help promote literacy by reading online -- over 75,000 books have been donated. It's called We Give Books (sponsored by Penguin & Pearson Foundation) and last week the goal was about setting a record for reading The Snowy Day. Check out the picture books on that site (Jan Brett's The Mitten is a personal favorite). While these books are not as interactive (yet?!) as they could be, they are still fun to read - especially if you are cuddling up with your child. Scholastic also recently released the 2010 Kids & Family Reading Report which talks about the appeal of digital texts. The "reinvention of print" seems well underway on several fronts. ...One App at a Time" or so says Mashable in Friday's post about Scroll Motion (11,000 apps and counting). 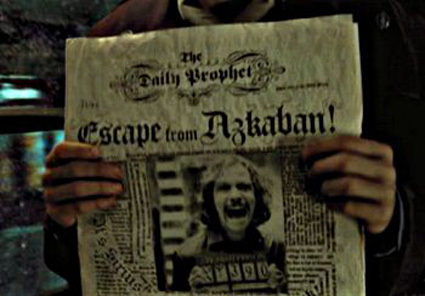 If you were intrigued by Harry Potter's Daily Prophet Newspaper (remember the talking pictures?) check out Mashable's post for a video of the new Esquire app which Scroll Motion helped develop. Then think about how some of that could work with textbooks and in education settings. Just last week, I spoke with teachers who were envisioning sheet music which "magically" scrolled or flipped pages as one played or about bilingual books with dictionaries and spoken pronunciation keys in two languages as students scrolled over words while trying to learn a new language... it's amazing what we will be able to do! This could definitely give Google Fast Flip a run for its money. The Associated Press has unveiled the AP Timeline Reader, a visual way to see and read the news. This was tweeted by one of my favorite teacher bloggers Larry Ferlazzo. He also recommends reading Richard Byrne’s post about it to learn more. Make sure to add it to LibGuide for students who are searching for current news. Should Colleges teach students how to be better Googlers? • Widespread and endemic gaps in students' understanding of the basic concepts of academic research, including: (1) an inability to correctly read and understand citations, (2) little or no understanding of cataloging and information organization systems, (3) no organized search strategies beyond "Google-style" any word, anywhere searches, and (4) poor abilities in locating and evaluating resources (of all types). • Students who had developed a relationship with a librarian reported high levels of satisfaction with the help provided, returned repeatedly for help other assignments, and recommend librarians to their peers. 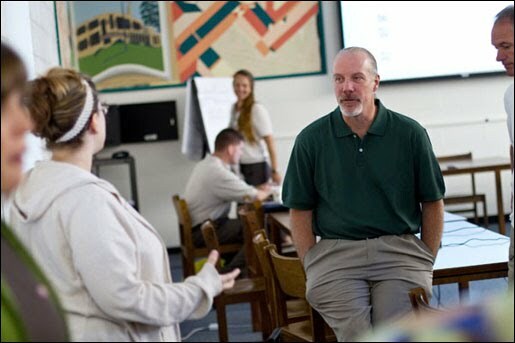 • As librarians build relationships with teaching faculty, they will also build relationships with students. Administrators can also contribute to these relationships by supporting curricular initiatives that reinforce collaboration between librarians and teaching faculty, and that promote the participation of librarians throughout students’ course of study. Howard Kurtz, columnist at The Washington Post, is moving from this newspaper to The Daily Beast, an online-only news source in D.C., in and what Kurtz sees as news outlet that is becoming a "primary news source breaking news." While he believes the print sources will be present for time to come, he also believes that some online sources will become strong and constant sources. The first by Buffy Hamilton (Creekview High School, GA) is titled “Beyond Balance: Participatory Librarianship for Creating, Connecting, Conversing, and Contributing” Scroll down the page to see her slide deck or skip around the libguide for many more ideas. The second, by Cathy Jo Nelson (Dorman High School, South Carolina), lists 10 Tools to a More Relevant Library including Blogs & Wikis (check out her specific suggestions); RSS Feeds; Aggregators; Social Networking Tools (Twitter, etc. ); LibraryThing; Google; Social Bookmarking; Digital Storytelling; Online Polls and Video Conferencing. These new apps will definitely enrich the experience for the TV watching crowd. My favorite is the Twitter app which allows you to stay connected to friends while watching your favorite show. Personally, I think the video is a little long (especially the beginning) and not quite in a student's "voice", but it makes some good points and Gale/Cengage has shorter videos about specific databases which we could easily include in a libguide like this one (scroll down that page). If you have been thinking about eReaders, digital texts, and your students, take a few minutes to read this recent article from School Library Journal. * PBS’s 2009 national survey, "Digitally Inclined," showed that 76 percent of K–12 teachers already use digital media in their classrooms (up from 68 percent in 2008). And 78 percent of those teachers believe that digital media increases a student’s motivation for learning. * "When we make the move to digital textbooks, ... it will be about open content. When it is about open content, we are going to see huge opportunities for school librarians." - Marcia Mardis, a professor at Florida State University. By the way, I tried posting this from an iPad since I have one to "play with" for a little while. If you have any suggestions on using iPads (or not using them), especially in regards to reading high school texts, please share your ideas in the comment section. So far, I agree with Mossberg's point (made here) that one can use an iPad on vacation, but I will definitely need more practice in order to embrace it for more regular use. All of which should not take away from the comments on experimentation, new initiatives, and pilot programs made by School Library Journal. Are online social networks eroding privacy? This article is available by subscription only at New Trier Library (and other libraries) but is worth sharing because of the soaring membership in sites like Facebook ( over 500 million users) and micro-blogging sites like Twitter (140+ million users). "For some, the new world of “radical transparency” will increase human understanding and encourage honesty and accountability. But some lawmakers and scholars concerned about losing older notions of privacy warn that more should be done to help individuals control how much of their personal data is publicly accessible." Do you know that in a 2009 survey, 46 percent of people accepted "friend" requests from strangers? Do you know that 100 percent of survey respondents posted their email addresses? Do you know that 89% of Facebook users in their 20s post their birth dates online? Clemmitt asks the question: Are online social networks changing social interaction for the worse? Some experts like Justin W. Patchin, Assoc. Professor of Criminal Justice at the University of Wisconsin argue that cyberbullying does happen, but it is not the norm among young people. The recent suicide of Tyler Clementi suggests that cyberbullying cannot be ignored. Tyler Clementi , a Rutgers University freshman jumped to his death after his roommate secretly filmed him during a "sexual encounter" in his dorm room and posted it live on the Internet. Clemmitt asks: Are new laws needed to regulate online social media? Google CEO Eric Schmidt predicts that eventually everyone may be entitled to one name change in young adulthood to protect themselves from adolescent indiscretions caught in digital photos that may be cached forever somewhere online. This doesn't even begin to address privacy invasions that were not indiscretions to begin with. Subscribers to CQ may want to read the PRO/CON arguments of whether Congress should enact legislation to enhance online privacy. The bottom line is that teens need guidance to avoid cyberbullying. We may want to re-think the blocking of sites such as Facebook in order to teach teens ethical behavior on social networks. Ito, Mizuko, et al., Hanging Out, Messing Around, and Geeking Out, MIT Press, 2010. Based on extensive interviews with young Internet users, scholars from the MacArthur Foundation-funded Digital Youth Project describe how online social media shape the digital generation's approaches to friendship, romance, creativity and family life. Jenkins, Henry, Convergence Culture: Where Old and New Media Collide, New York University Press, 2006. A professor at the University of Southern California's Annenberg School for Communication explores the possibility that a public connected through online social media may eventually exert significant influence over how traditional media are produced and consumed. Kirkpatrick, David, The Facebook Effect, Simon & Schuster, 2010. A former senior editor for Internet and technology issues at Fortune chronicles Facebook's founding and history. Palfrey, John, and Urs Gasser, Born Digital: Understand the First Generation of Digital Natives, Basic Books, 2008. The director of Harvard Law School's Berkman Center on Internet and Society (Gasser), and a Harvard professor of law (Palfrey) discuss how extensive use of digital media may change how individuals and, eventually, the law regard privacy and identity. Shirky, Clay, Here Comes Everybody: The Power of Organizing Without Organizations, Penguin Press, 2008. A consultant and lecturer on new media argues that online social media can provide endless opportunities for enhanced information sharing, activism and creativity. Watkins, S. Craig, The Young & the Digital: What the Migration to Social-Network Sites, Games, and Anytime, Anywhere Media Means for Our Future, Beacon Press, 2009. Based on extensive interviews and survey data mainly from teen and 20-something Internet users, an associate professor of media studies at the University of Texas, Austin, argues that social network sites, online games and mobile devices mainly serve to help the digital generation keep in touch with their friends. Angwin, Julia, and Tom McGinty, “Personal Details Exposed Via Biggest U.S. Websites,” The Wall Street Journal, July 31, 2010, p. A1. Among the 50 most popular Websites in the United States, only Wikipedia.org has not installed any software to track visitors after they leave the site. All told, the 50 sites have 3,180 tracking tools, with some sites having up to 100 tracking tools apiece. Cutler, Kim-Mai, “Why Mark Zuckerberg Needs to Come Clean About His Views on Privacy,” Venturebeat, May 13, 2010, http://social.venturebeat.com. Even as repeated changes to Facebook policies makes some users fear they've lost control over their personal information, the company's founder and CEO, Mark Zuckerberg, hasn't fully articulated what he believes about how such information should be shared. Hwang, Tim, “Das Zuck-ital: The Economics of Social Networks and the Collapse of Privacy,” Brosephstalin blog, June 4, 2010, http://brosephstalin.com. Reaping continued profits from social networking sites likely requires companies to gather very large amounts of personal information about each user. Rosen, Jeffrey, “The Web Means the End of Forgetting,” The New York Times Magazine, July 19, 2010, p. 30. A George Washington University professor of law argues that increased sharing of private information via social media requires us to develop new norms for what kinds of behavior we'll hold people accountable for. Wingfield, Nick, “Microsoft Quashed Effort to Boost Online Privacy,” The Wall Street Journal, Aug. 2, 2010, p. A1. Microsoft rejected a plan by some of its software developers to make it easy for Internet Explorer users to avoid being tracked by advertisers when they're online. “Millennials Will Make Online Sharing in Networks a Lifelong Habit,” Pew Internet & American Life Project/Elon University Imagining the Internet Center, July 2010, www.pewinternet.org. Many Internet analysts say the advantages of personal disclosure will outweigh privacy concerns for people born in the digital age. “The Future of Social Relations,” Pew Internet & American Life Project/Elon University Imagining the Internet Center, July 2010, www.pewinternet.org. A majority of scholars and technologists surveyed say online social communication will ultimately improve human relations. Comments on Facebook-related news from social-media analysts and Web developers. Multidisciplinary association of scholars studying the Internet. Research center studying legal and social ramifications of Internet issues. Provides commentary on communications-technology and media issues from a libertarian point of view. Advocates for protection of Internet users' civil liberties. Updates about Facebook policies and activities posted by the company. Website of a university-based research center provides analysis and information on how new media will affect the future. News reports and analysis on social media by technology writers. Foundation-funded research group provides statistics and analysis on Internet use, including social media. New Zealand-based technology writer Richard McManus and others analyze trends in online technology. Why should we know about Goo.gl? Everyone does need to understand the function and utility of a URL shortener. URL shorteners make a long URL into fewer characters to make it easier to share with others. It helps the user to deal with character limits in tweets, status updates etc. A shorter URL leaves more space to share ideas— that's why people use them. The other less well known functionality of URL shorteners is that they also provide real-time click stats and analytics for the user. With the new Goo.gl shortener sophisticated users can also add a QR code (Quick Response code) which contains much metadata; a QR code can be read by scanners and mobile devices. Is this a good thing? Yes, if you are running a website and are interested in analytics. Why would Google bother to provide a URL shortener when so many (TinyURL and Bit.ly) excellent ones are already available? The reasons they offer are stability, security and speed. I love my Tweetdeck because it automatically shortens by urls. Perhaps Twitter will add goo.gl to its platform. Otherwise I probably won't use it much. 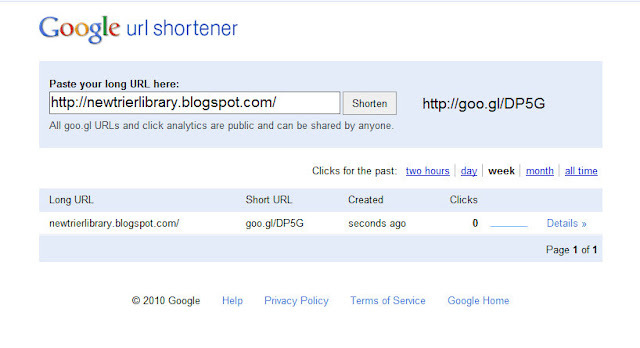 Read and learn more about Google's URL shortener.